This book tells the story of local-level controls on liquor licensing (‘local option’) that emerged during the anti-alcohol temperance movement of the late 19th and early 20th centuries. It offers a new perspective on these often-overlooked smaller prohibitions, arguing local option not only reshaped the hotel industry but has legacies for, and parallels with, questions facing cities and planners today. These range from idiosyncratic dry areas; to intrinsic ideas of residential amenity and neighbourhood, zoning separation, and objection rights. 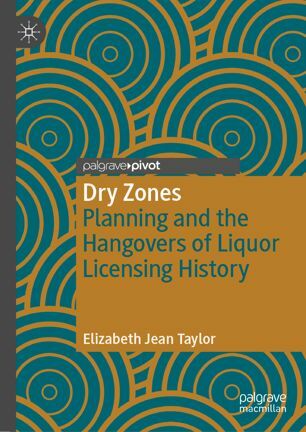 The book is based on a case study of temperance-era liquor licensing changes in Victoria, their convergence with early planning, and their continuities. Examples are given of contemporary Australian planning debates with historical roots in the temperance era – live music venues, bottle shops, gaming machines, fast food restaurants. Dry Zones uses new archival research and maps; and includes examples from family histories in Harcourt and Barkers Creek, a district with a temperance reputation and which closed all its hotels during the temperance era. Suggesting ‘wowsers’ are not so easily relegated to history books, Taylor reflects on tensions around individual and local rights, localism and centralism, direct democracy, and domestic violence, that continue to be re-enacted. Dry Zones visits a forgotten by-way of licensing history, showing the early 21st century is a useful time to reflect on this history as while some temperance-era controls are being scaled back, similar controls are being put forward for much the same reasons.